Iliotibial Band Syndrome, or ITBS, is one of the most common causes of pain that is felt on the outside of the knee. 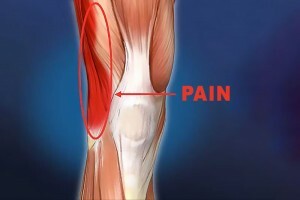 It is mostly common in runners, hikers and cyclists, but any athlete who plays sports that require repeated knee flexion can find himself/herself dealing with IT Band pain. The Iliotibial Band is a tough, thick fibrous tissue composed of fascia that runs along the outside of the thigh from the hip to the kneecap and tibia of the lower leg. Repetitive flexing and extending of the knee (as what occurs in running) may result in friction and inflammation of the IT Band, on the bursa between the IT Band, or on the femoral epicondyle of the knee. Over time, this irritation leads to IT Band syndrome. If you have IT Band tightness, using a foam roller regularly is one of the best things you can do at home to help relieve your pain. It’s important to change your running shoes every 3 to 4 months. Worn shoes absorb less shock which may lead to an increased incidence of IT Band pain. If you run lots of kilometres, consider alternating between two pairs of shoes to allow 24 hours for the shoe’s shock absorbing cushion to return to its optimal form before running in them again. Add hill running workouts gradually. Hill running, particularly downhill running, increases friction on the IT Band and is tough on the quadriceps. As the quads endure fatigue, they lose the ability to stabilise and control the knee tracking position, which also increases stress on the IT Band. Avoid training on uneven surfaces. Keep the knee joint covered and warm. Many athletes fail to protect the knees adequately in cold temperatures. The IT Band is particularly susceptible to the cold and experts recommend that athletes keep the knees covered during sports when the temperatures are below 15 degrees Celsius. Always cool down and stretch after exercise.